Milner studied at Leeds College of Art and then the Royal College of Art. 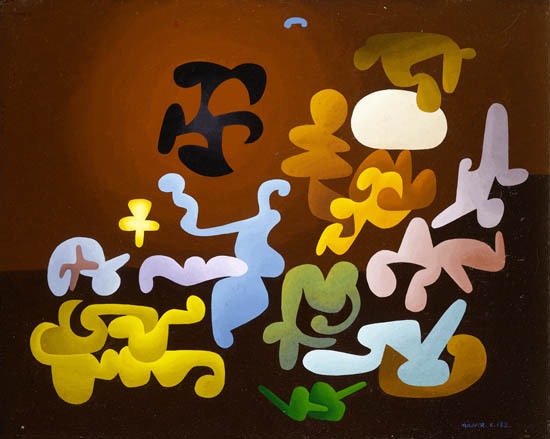 He exhibited in mixed exhibitions at the Mayor Gallery (1932), Redfern Gallery and Gimpel Fils and had solo shows including E.L.T.Mesens’ London Gallery in 1949 and Woodstock in 1967. Salford Art Gallery bought an oil, Abstraction, in 1956. Milner settled in Ramsey, Isle of Mann where he was the founder member and became vice-president of the Mannin Art Group where he was a prolific exhibitor. The artist was described by one friend as a stout bohemian fellow, competent with brush and corkscrew. This composition, dating to the late 1960's, is from the period that Milner showed at the Woodstock Gallery is London. The numbers that appear alongside Milner's signature are actually the titles of his pictures which were classified by a series of numbers, often prefixed by a letter. We are grateful to Conor Mullan for assistance.